I have 2 pairs of Dr. Martens boots and I have always wanted the oxford kind. I have had my eye on these for quite a while now. What stopped me was the $110 pricing of them. I decided to browse eBay (as usual) and stumbled upon these babies! I was so excited when they came in today. They are so similar to the real ones. Once again, Ebay never fails. P.S. If you're wondering who the seller is. I got it from here. 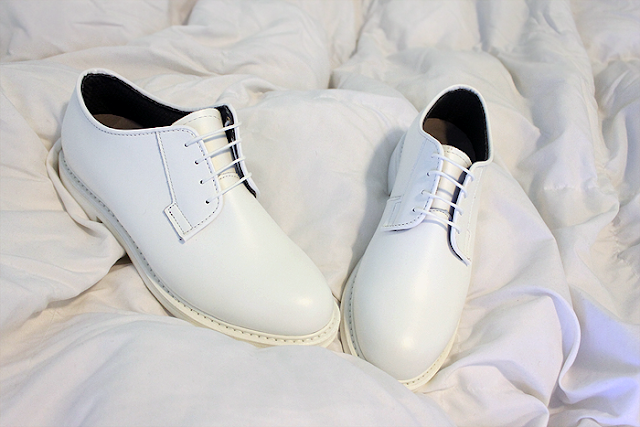 I have been looking around for a perfect casual white laced shoes. I just might consider this. Thanks! Oh WOW, Love the new Doc's! Now i am following you via GCF and bloglovin . Thank you for a comment:) Your boots are beautiful! Wauw, great shoes! Really really love them, kind of dangerous color, but it's worth trying. hey sharena! thanks for stopping by my blog. LOVE yours!!! Girl, my best friend is eBay! You can really find some deals on there. Love your new purchase.